trying to influence department for transport ministers to tinker around the edges as a solution to the A14. The A14, particularly from Cambridge to the A1(M), needs massive improvements, including in my view widening, to make it a safer and more reliable route. The behaviour of some of those who use the road, and the volume of HGV traffic, are things which need addressing, in addition to making improvements to the fabric of the road. I think ideas which could be implemented rapidly, such as tolls for HGVs in peak periods, or banning HGVs overtaking should be considered alongside longer term options such as making rail freight more attractive, encouraging goods to be brought into the country via other ports, and making it less attractive to drive goods across the UK to reach Ireland from the continent. I think there is also a role for improved traffic policing, particularly targeted on ensuring HGVs are safe and legal and are being driven with appropriate care and attention. Some Liberal Democrats in Cambridge are irrationally anti-car, to an extent that if their views led to policies which were implemented, they would make Cambridge an impractical place to live in, and no-doubt, as the current state of the A14 does, damage the city, the region’s and the country’s economy. I think where Cambridge LibDems have been able to gain wider public support in Cambridge is in opposing the creation of a ten+ lane road between Cambridge and Northstowe, with four lanes being for local traffic. This option is proposed as an alternative to requiring the proper upgrading of the A14 and the installation of high quality junctions. My view, and one I have expressed from the beginning of the planning process, is that the proper upgrading of the A14 ought be a pre-requsite for starting to build homes in Northstowe. In my experience if you’ve come to the conclusion that Julian Huppert is off his rocker then you’ve probably misinterpreted what he is saying. I think he is right that there are improvements which can be made easily and cheaply, we have junctions with minor roads, short slip-roads, and other dangerous features which could be tackled very quickly. As soon as possible though I think the road ought be upgraded to motorway standard, with three lanes, effectively taking the M11 round the corner to Huntingdon and connecting the M11 to the A1(M) and any work done from now on ought be with that ultimate aim in mind. I would like to see our local MPs and other elected reps making a case that it makes economic sense for the country as a whole to invest in this upgrade as the outputs from the greater Cambridge area have the potential to make an even greater contribution to the national economy. While Huppert is a party politican and is careful not to upset the more diverse elements of his local party I don’t think he’s actually said anything contrary to the views I have expressed myself here. In terms of the current debate, and in particular, decisions on where the relatively small sum of money recently allocated in the national budget is spent, I would like to see Cambridgeshire Police release collision investigation reports so that causes of incidents on the road can be properly understood and addressed. Similarly I would like to see economic and transport data made openly available so an evidence based public debate, and publicly supported local case to central government for investment in the road, can be made. We regularly see false starts suggesting such an inclusive, open and well informed, public exercise will take place, but our elected reps, including Cllr Clarke, never appear to follow through on their words. I note Cllr Clarke tweeted his attack on his personal account and it also appeared on the new CCC_Cabinet twitter account but in neither case was Huppert’s Twitter name @JulianHuppert mentioned which would have drawn it to his attention. 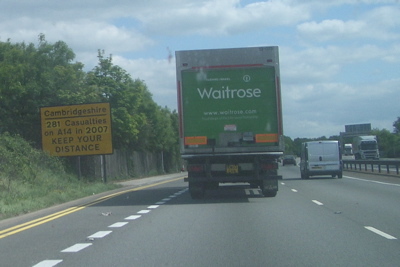 This entry was tagged A14, Cambridgeshire, Police, Traffic, Transport on June 15, 2012 by Richard Taylor. I hope that’s not going to cost £20m, the article does say it’s just the start. I’m afraid Huppert cannot be let off the hook (a) while he continues to oppose the urgently-needed capacity improvements and (b) unless the changes he advocates can accommodate capacity improvements without having to be redone when sanity later prevails, at the cost of doing the junction work twice. Transport Minister Mike Penning issued a press release on the A14 improvements yesterday (14 June 2012). This was apparently distributed by the now closed COI.gov.uk but not available on any Government website. Advance work on a £20 million package designed to reduce congestion and improve journey time for motorists along the A14 in Cambridgeshire will start this summer. The improvements have been devised to reduce traffic jams at key junctions, improving flow on the A14 between Cambridge and Huntingdon. The initial work will start next month ahead of the main improvements commencing in 2013. “Improvements will include changing the layout of the major junctions at the both ends of the Cambridge to Huntingdon section – the Girton interchange at junction 31 and Spittals interchange at junction 23. * Larger scale improvements are planned to be delivered in 2013 following completion of ongoing design work. The £20 million package is being delivered alongside the Department’s A14 Study, which delivers on the Government’s commitment to increasing capacity and improving performance on the A14 made in the Autumn Statement. Responses to the A14 Challenge – launched in December 2011 – have been used to help generate and refine options for doing this. Today, the Department has published reports from the second phase of the A14 Study that shortlist three draft public transport improvement packages, two draft freight improvement packages and six draft highway improvement packages, as well as a summary of responses to the A14 Challenge. The Department will investigate the short listed options for improving the A14 further in order to identify a preferred package of improvements by summer 2012. But as Julian pointed out, Andy, we can either ask for a multi-million pound scheme which will never get off the ground because the money isn’t there, or we can push for something cheaper (in relative terms) and do-able which can be built now. Getting freight onto rail seems like a good idea whatever the economic climate and that would make quite significant change to the conditions, I think. Section 3.10 of the response document says central government is considering a new Park and Ride for Cambridge. consultees suggested the proportion of containers moved out of Felixstowe by rail could be increased, from around 25% now, to the levels of rail market share currently achieved at Southampton. The government response doesn’t say what the position in Southampton is. As of February 2012 35% of containers were moved by rail from Southampton. (source). Significant scope was identified to increase the proportion of freight hauled by rail if investment continues to be made to upgrade the Felixstowe to Nuneaton (F2N) rail line, which links the port facilities at Felixstowe with the Midlands, the North West, North East and Scotland. Widening the A14 on the existing route from Bar Hill to Huntingdon. Further incremental improvements at Girton junction. The report also notes the future of the Huntingdon Viaduct will be a major consideration in the design of any options to improve the road. Currently lots of money is being spent to maintain that bridge, and that money could be going to waste if the route of the main trunk road was diverted away, and moved south. Allowing A14 traffic to flow freely, rather than stopping at roundabouts, at the Brampton Hut and Spittals interchanges is also mentioned on one of the maps included in the government response. That sounds to me like an obvious, great, and presumably fairly cheap option, but it isn’t specifically addressed in the text. [The Government] will also carefully consider the scope for road improvements to be part-funded through tolling. My view is I would like to see consideration given to tolls aimed at deterring HGVs from using the road at peak times especially, and perhaps making the road less of an attractive option, and rail more so. This is very confusing, there are 6 schemes being considered according to the actual consultation response, the associated documents list 14, and as I’m writing this the BBC Radio news is telling me 10 options are currently in the running. I don’t think the economic case has been made effectively, and quantitatively. There is a lot more to the economic case than eliminating wasted time sat in traffic. The greater Cambridge area could become a more attractive place for people to live, work, and base companies. Although the accident rate per vehicle mile on much of the route is not significantly above the average for roads built to a similar design standard, this needs to be seen in the context that the road is below the standard to which a modern road would be designed. There are sections where accident rates are much higher than would be expected for roads of a similar standard. However, because traffic flows on the route are high there are a large number of accidents and disruptive incidents that cause delay on the A14 and have knock-on effects on the surrounding network. There is therefore considerable scope to reduce accident rates and the impact of incidents through improving the standard of the road. There is no sign of the police co-operating with and having input into the process at all. I think the police ought be providing information, and policing the road ought be considered as one of the routes to making it safer and making journey times more reliable. A clear and interesting exposition of the plans. However, I feel that some of them are trivial and unlikely to have any measurable effect. The problem is that we have two routes A14 and M11) using the same road. And that a substantial percentage of the traffic is limited (by law) to 50mph, some traffic is limited to 60mph, and the rest is subject to 70mph. A large proportion of the HGV traffic is left hand drive, with drivers unfamiliar with the road network. This road is a two lane dual carriageway – there are no hard shoulders (in fact there are usually only soft verges) and the central reservation is inadequate for the volume (and weight) of traffic. It carries ALL of the A14 traffic, and ALL of the M11 traffic. Someone needs to admit that the original design was a bodge/botch job with an inept design – but that would mean people being put before the court for the manslaughter that has since occurred as a result of poor decisions. To persuade the HGV traffic onto rail would need an upgrade of the rail system. The rail tunnels at Ipswich were modified to allow container traffic some years ago – however there is still a tortuous route from Felixstowe to the Midlands. What about a rail link from Cambriodge to Huntingdon? and – while we are about it – reinstatement of the links from Colchester to Cambridge, and from Cambridge to Bedford. Whilst you are thinking about Northstowe – a new town at Mildenhall and reinstatement of the railway from Mildenhall to Cambridge would be a more interesting option. Keep up the good work Richard, and don’t let vexatiouus litigants get you down! cobweb, I don’t think you got my point, which is that the active campaigning against capacity improvements which Julian and his friends engage in undermine’s the argument you have made and that we need to make sure that any such interim changes can accomodate and be a first stage of any future capacity improvements. I think it’s more “Julian’s friends” than “Julian and his friends”. ie. I think it’s some of the local LibDems in Cambridge , and not specifically Huppert, who are vehemently and irrationally anti-car and don’t want to see traffic flowing more freely, with more reliable journey times, on the A14. If the cost of freely-flowing traffic on the A14 is a huge increase in traffic on Huntingdon Road and Histon Road then it is legitimate for the MP representing the area most significantly affected to speak out against it. I must admit I only saw figures for the earlier scheme when Julian was still a County Councillor but even for that smaller scheme the extra inflow was just awful. Perhaps you can find more recent models? Ah yes, Rupert’s old hobby horse of how making the A14 fit for purpose will mean lots of lorry drivers stopping to take in the views on the Backs. Do the Lib Dems ever wonder why the rest of us thing they are simply bonkers? Ah yes, a classic Tory personal attack, ignoring the numbers that are actually Highways Agency predictions (though for a smaller scheme than the one that went to ‘orders’. And, it is one with the current Conservative view that seems to want to punish those areas that vote Lib Dem (Cambridge, Ely) by covering them with concrete and pollution.